Species can respond to global warming in two ways: adapt and survive, or die. Biologists foresee climate change driving many species to extinction over the next century, especially those that are unable to adjust rapidly enough. Plants and animals evolved to survive in specific ecological niches, and while some may adapt to new environments  and many have already  for many others, it will take time. But the changes driven by human-generated greenhouse gases may be coming on too fast. That's exactly what appears to be happening with the worldwide lizard population. A few years ago, a team of herpetologists first noticed a suspicious pattern of extinctions among populations of European lizards. At the time, it wasn't clear why they were dying  it could have been global warming, but it also could have been disease or loss of habitat. So researchers set out to get the hard evidence, ultimately launching a global study that eventually drew in more than two dozen scientists from around the world. The results, appearing in the May 14 issue of Science, are dramatic: populations of lizards have been lost on five continents over the past few decades, and based on these extinction patterns  and the current rate of global warming  scientists predict that by 2080 nearly 40% of all lizard populations and 20% of lizard species could vanish. Given that lizards are a key source of food for many birds, snakes and other animals, and are important predators of insects, the disappearance of these animals could have major repercussions up and down the food chain. The results are not just dramatic but also convincing, thanks to some meticulous science conducted by lead author Barry Sinervo of the University of California at Santa Cruz. "I was originally looking at lizard evolution, but in chasing down that story, I found this story," he says. "The extinctions in France seemed to be happening mostly at the southern edges of the lizards' ranges and at lower elevations  in both cases, the warmest parts of their habitats." Sinervo wondered whether the French phenomenon of extinction would be seen in other parts of the world. 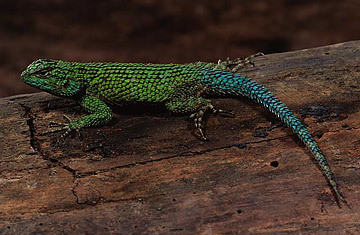 Between 2006 and 2008, he and a team of scientists surveyed 48 species of the Sceloporus lizard at 200 sites in Mexico  populations for which they already had data going back to 1975, when the sites were first surveyed. Comparing data from the two time periods, Sinervo discovered that about 12% of local populations had died out by 2009. The only environmental factor that had changed during that time was temperature. The theory was that the heat wasn't killing the lizards directly, but rather preventing them from reproducing. Sceloporus lizards, like most others, are diurnal  active during the day  and cold-blooded, so they can't regulate their body temperature. On hot days, they tend not to move around much, preferring to laze in cool burrows so as not to overheat. As global warming causes weather to get hotter and stay hotter longer, lizards  especially species that live in the warmest areas  spend more time seeking refuge out of the sun. "They have so little time during the day to forage and so little time to reproduce that conditions become untenable [for survival]," says Aaron Bauer of Villanova University, a co-author of the study. To test that theory, Sinervo and his team spent a year creating a predictive model of extinction, based on what they knew about lizards' heat sensitivity, where different species lived and the measured increases in local temperatures over the past 30 years. The model pinpointed exact sites where extinctions should be happening. The scientists then scoured the scientific literature and contacted herpetologists around the world to see how the animal populations had fared. Sure enough, populations of lizards were vanishing in just the places the model had identified. "It's sort of striking," says Bauer. "Not only does the model predict where lizards should be disappearing; it also predicts where they should not be in danger." In the southern hemisphere, for instance, where a greater ocean-to-land ratio has kept temperature increases relatively moderate so far, lizards have largely escaped extinction, according to Bauer. The fact that the model's predictions match the real world so closely is impressive. It's also somewhat depressing, considering the grim fate the model predicts for the animals by 2080, based on the current rate of greenhouse-gas emissions. But at least scientists now have a handle on the scope of the problem. Beyond that, the lizard-extinction model could perhaps be applied to other species. "We're working on amphibians now," says Sinervo. "They're a little more complex, because they're sensitive to both heat and drought." Mammals are more complex still, but even they might be amenable to this sort of extinction modeling. "I think we now have a really good idea of how to do this," Sinervo says.